Here is The Art of the Deal. The invasion of Glenwood was led by Apex Investments of Dubai. Springfield and Eugene refused my history of the Miller Brothers, and John and Jessie Fremont. What are they giving the people? What are they giving women, and men? Who wants this empty clean space of the mind? Why did so many women vote for Trump? Who is bankrolling these projects? The Arabs got wealthy from the oil they own. They pretend there is a cultural exchange. There is not. Araba leaders are barbarians, family run oligarchies that our President emulates to the delight of squealing white women. Who are these Hotel Cartel People? What are they not being questioned? Do we want what they have to sell? Are they helping the homeless? Who are they? We are just cattle to them. Their prices are too high. They should be cut in half, or, we should become a Socialist Nation and offer free transportation and lodging – along with free medicine! 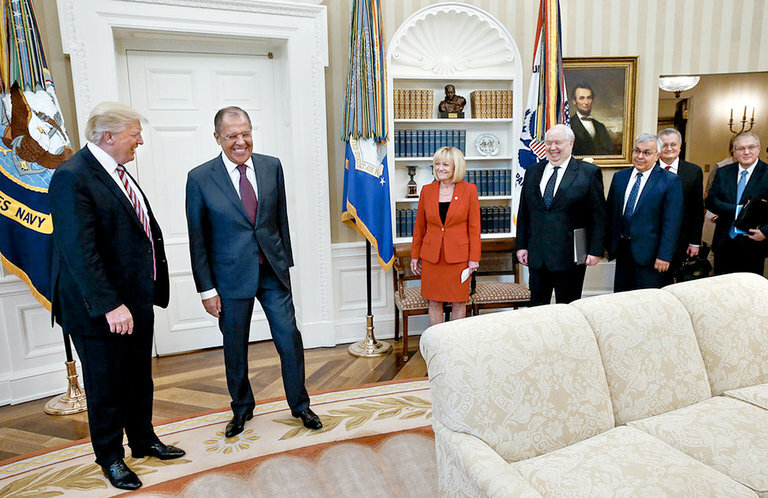 It is clear to me what the Trump Buddies are up to. They want to make the Rich of the World even richer so they will invest in, and stay in, their Luxury Hotels on Boardwalk and Park Place. If they have to take food stamps from children, and put poor seniors out on the street, the will do so with a snigger, a snort, and a chuckle! A crazy nut is someone in power who is not willing to join the boys in the locker room and go after The Poor – with glee! The Press is not the enemy, The Poor, is their main target. 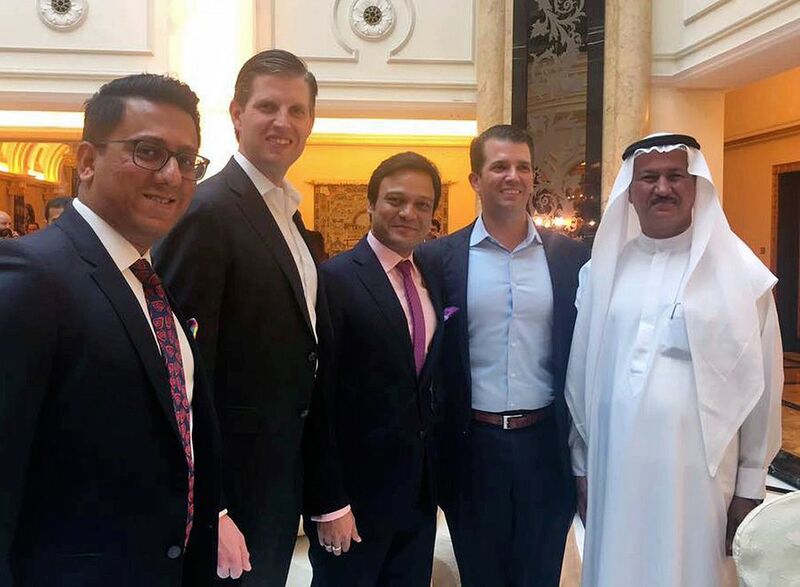 Banke International director Niraj Masand, far left, poses for a photo with Eric Trump, second left, Banke International director Porush Jhunjhunwala, center, Donald Trump Jr., second right, and DAMAC Properties chairman Hussain Sajwani, during festivities marking the formal opening of the Trump International Golf Club, in Dubai, United Arab Emirates on Feb. 18. President Donald Trump’s adult sons, who now manage his sprawling business empire, were guests of honor at the launch of a new luxury golf course in Dubai, the first opening of a Trump-branded property since Inauguration Day. Eric and Donald Jr. presided as the red carpet was rolled out at the 30,000-square-foot (2,787 sq meter) clubhouse for the Trump International Golf Course, the first Trump golf resort in the Arab world. The plush kick-off event started just after sunset on a clear, blustery evening. Guests — a mix of local and foreign business people — were treated to canapes of quail egg, tuna tartar and spring rolls, and a string orchestra played Vivaldi’s “Four Seasons.” No alcohol was served. 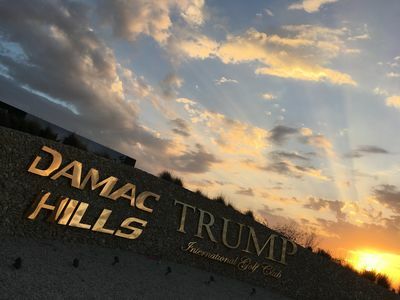 The 18-hole course is part of a larger villa and apartment building project by Dubai-based developer Damac Properties Dubai Co. PJSC, which is owned by billionaire Hussain Sajwani. The layout was designed by architect Gil Hanse, who also designed the 2016 Olympic course in Rio de Janeiro. A corporate membership is about $15,000 (55,000 dirhams) up front plus about $21,800 per year, according to a rate card distributed at the event. A single person can join for $6,800 plus a $9,530 annual fee. As president-elect, Trump said he turned down a $2 billion deal with a major property developer in Dubai because he didn’t “want to take advantage of something.” Damac confirmed the talks with Trump, without specifying whether the deal involved properties in Dubai or when the discussions took place. InnSight Hotel Management Group is always looking to strengthen our leadership and management team with the best talent available, and we may be looking for you! We offer healthcare benefits, paid time off, and travel industry discounts. At InnSight, we expect our team members to make us as successful as we can be, and we believe in doing the same for each of them. We are committed to the development of our associates and the advancement of future leaders. Exemplary InnSight associates may be nominated for our Leadership Training Program, a challenging year-long instruction course on leadership fundamentals led by our Director of Operations and Human Resources Manager. More than a few people probably rolled their eyes when they read a story in Thursday’s Register-Guard describing a proposal to build a $43-million riverfront hotel and conference center on Franklin Boulevard in Glenwood’s gritty, underutilized riverfront district. After all, similarly ambitious proposals have surfaced in the past only to disappear like morning mist on the Willamette River. In 2007, at the height of Oregon’s last economic boom, Apex Investment Group, an international development company, announced plans for transforming an unincorporated jumble of industrial, retail and residential properties in Glenwood into a vibrant mix of housing, shops, restaurants and offices. A year later, the plan was dead. Developers cited unfavorable market conditions, a nice way of saying the project wasn’t economically feasible, especially in light of the area’s lack of infrastructure and the absence of an overall vision and detailed plan for how Glenwood should evolve. But there are reasons to believe the most recent proposal will succeed where others have failed. They include Springfield’s completion of the Glenwood Refinement plan, a comprehensive long-range strategy for the region and for addressing the daunting obstacles that have long hindered its redevelopment. Richard Boyles, president and co-founder of Springfield-based InnSight Hotel Management Group, which manages about a dozen hotels in Oregon and Washington, remains skeptical of the latest Glenwood project. Boyles said Vik approached him a year or two ago about joining the project. Boyles passed on the venture. Boyles questioned whether there is a enough conference business to make the project profitable. He also wondered whether conference bookers will be keen to hold events at that location when some attendees would have to stay elsewhere. Allen Lonstron, another member of the local development group, acknowledged that attendees would have to stay at other hotels in the area until Glenwood redevelops with more hotel rooms. But he said that’s typically the case with conference centers and doesn’t see it as a setback. Lonstron said the Eugene-Springfield area has fewer rooms and meeting space at full-service hotels, which include rooms, meeting space and in-house food service, than it did a decade ago. The area has three full-service hotels: the Hilton Eugene, the Valley River Inn and the Holiday Inn Eugene/Springfield. The Lane Events Center and Lane Community College have meeting space but no hotel rooms on site. The past year was unkind to billionaires all over the world, including the Middle East, where Arab billionaires saw their net worth drop by 23.8% from a year ago. Still, FORBES MIDDLE EAST added five new billionaires, including Hussain Sajwani from the U.A.E., Sheikh Faisal Bin Qassim Al Thani of Qatar and Oman’s Suhail Bahwan. Prince Alwaleed of Saudi Arabia remains the wealthiest Arab in the world, even though his net worth fell by more than 20% from a year ago.At 7, Lebanon has the most billionaires, making it also one the countries with the highest number of billionaires per capita in the world. Saudi billionaires are the richest with a combined net worth of $34.6 billion. The second richest are from the U.A.E. with a combined net worth of $19.7 billion. Families remain pillars of Arab economies, providing jobs and stability. Saudi Arabia again tops the rich list, with 12 of the 15 richest families. Nine out of the 15 families made a fortune owning licensing rights to foreign brands, mostly American. Forbes Middle East traces the trajectory of the Alajlan family, from small shop owners, selling menswear in a Riyadh souk, to exclusive licensees of Versace, Ferrari, Kenzo and other luxury brands for shemaghs, the traditional Arab headdress. The Prince owns stakes in private and public companies in the U.S., Europe and the Middle East through Kingdom Holding Co.
Fahd Hariri is the youngest son of slain Lebanese Prime Minister Rafik Hariri. While he currently lives in Paris, he develops residential buildings in Beirut. Bahwan started out as a small trader before diversifying into several industries. Sajwani founded residential real estate developer Damac Properties in 2002. At age 16, Al Thani started selling car parts in Doha, before establishing his eponymous holding company in 1964. Al Rostamani and his late brother, Abdullah, founded Dubai’s first bookshop in 1954. Bahwan’s late father became Toyota’s agent in Oman in 1975 and built it into a market leader. View the full list of 2016 Arab billionaires rankings here. The 69-year-old Olayan Group remains one of the largest family-owned holdings in the Middle East. It has partnerships with Kimberly Clark, Coca-Cola and General Foods, among other companies, and is a major investor in stock markets. Founded in 1890, M.H. Alshaya Co. operates more than 2,800 stores across the Middle East, Russia, Poland and the Czech Republic, including Starbucks, H&M and The Body Shop. Founded by the late Mohammed Abdulmohsin Al-Kharafi, the Kharafi Group is one of the Middle East’s biggest conglomerates and a major investor in the Kuwaiti stock market. The late Ismail Ali Abudawood founded a small wholesale business in 1935 in Jeddah. Two decades later, the Abudawood Group became the exclusive agent for Procter & Gamble. Ajlan Alajlan opened a small shop in Riyadh in 1978. He and his brothers now own five garment factories in China, and sell clothing in more than 6,000 stores throughout the Gulf. Founded in 1970, to date the Al Jaber Group has laid 7,000 kilometers of roads in the Emirates, and is the largest private sector employer in the country with more than 60,000 workers. Holding Abdullah Said Bugshan Co., founded in 1923, was split between Khalid and his two cousins, Ahmed and Abdullah in 1998. Khalid Bugshan is CEO of Saudi Bugshan Group. Fawaz Alhokair Group is Saudi Arabia’s most valuable retail company with 11 shopping centers across the country, and rights to global brands including Zara, Gap, Nine West and Topshop. Ahmed Salem Bugshan is chairman of one of three offshoots of Abdullah Said Bugshan Co. The group owns half of the Pepsi bottling and distribution operation in Saudi Arabia. Founded in the 1930s, the Al Nahla Group is a conglomerate with interests in automobiles, food and real estate. It owns 40 million square meters of land in Saudi Arabia. Rashed AlRashed founded AlRashed Group in 1950, selling building materials during Saudi Arabia’s construction boom. He later diversified into real estate, automotive parts and food. Abdullah Al-Dabbagh founded the Al Dabbagh Group in 1962. Amr Al-Dabbagh, who was chairman of the Saudi Arabian General Investment Authority, now heads the family holding. In 1955, Abdul Latif Jameel won exclusive rights to distribute Toyota in Saudi Arabia. He passed away in 1993, and son Mohammed became chairman and president of Abdul Latif Jameel Co.
Brothers Mohammed, Abdulkarim, Abdulsalam, Abdullah and Nasser opened Jarir Bookstore after graduating. Jarir went public in 2003, now selling smartphones, office supplies and laptops. Mohammed and his brother Abdullah founded the Alsubeaei Company in 1933. In 2010, the second generation divided the assets and Mohammed’s family formed MASIC. View the full list of the Arab world’s richest families rankings here. Net worths are estimates as of February 12, 2016 for individual billionaires (unless otherwise stated) and March 8, 2016 for the families, where several relatives own shares in the same holding, but division of ownership is not known. The cut-off is $1 billion. Although he’s a native of India, FORBES ranks P.N.C. Menon as an Omani national, as he is a citizen of that country. I went brainstorming again last night. Why Glenwood? Why don’t I just let them have their way?